In the pursuit of great mandolin tone, we often overlook the obvious. We start looking for the ultimate instrument, at least one that's within our budget (or slightly more), or we think of changing the strings, or accessory aftermarket products like tone-gards or armrests--all the peripheral "stuff" we can add to our equipment. If we're even more mature in our playing, we've also thought of a good shop adjustment or other physical tweaking, but what we really ought to be concentrating on is our articulating hand. Again, speed is very important, or more properly, lack thereof! This must be played SLOWLY, and let's just all admit there is no way we can do this accurately or with discipline sans metronome. What you are striving for is the best articulation possible, with full concentration on the pick strike, follow-through, and preparation for the next strike. It's like a coach preparing for a game. You have the preparation, the actual game, and the post-game survey to figure out what you're going to do next time. Play this with full attention to the tone of each note! Go back and review the instructions in the MandolinSessions article for tips on how to discipline yourself, not only in playing this through, but incorporating it in the larger picture regimen of your practice. Just like in sports; nothing better than a clean sweep! 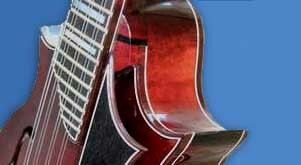 Read previous MandolinSessions archived articles.